Click the button below to add the Eagle 5.5 HP Honda GX-160 Gas Engine 10-Gal. Wheelbarrow to your wish list. 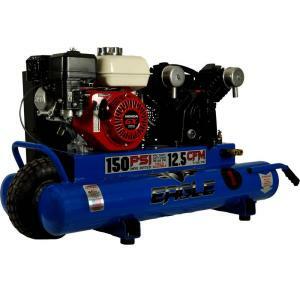 The Eagle Gas GX160 5.5 HP (Honda) features market leading 10-Gallon air tank, high flow cast iron V-style pump that generated 12.5 CFM at 100 PSI. This compressor is equipped with a High Flow V-Style cast iron pump, and high efficiency reed valves for longer life. Other feathers are, all metal belt guard for maximum cooling, pressure gauge for easy read,and auto drop premium air filters.